Stump standers. Show kids how to enjoy nature. Photo by Emily Kuntz. March is all about mud, sandhill cranes and those glorious first warm days. 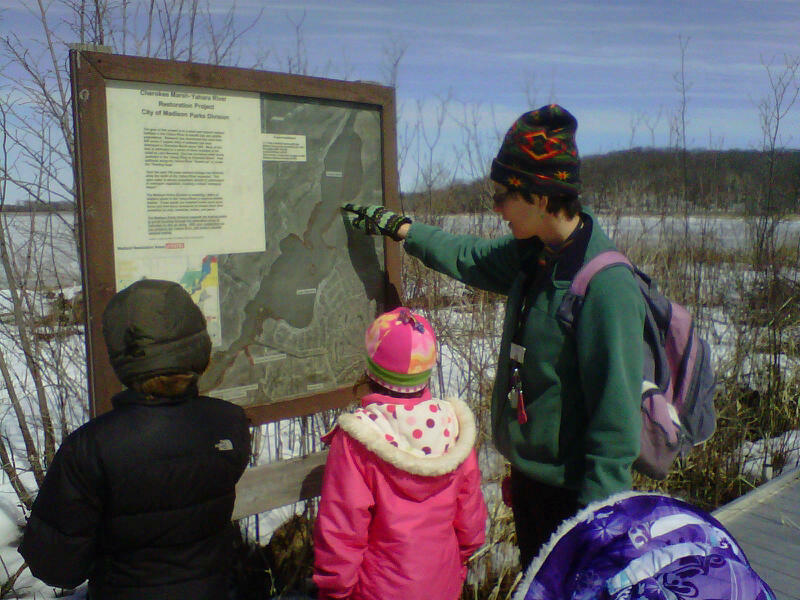 A few weeks ago, I took 12 kids and two adult volunteers to Cherokee Marsh for some mudilicious fun. We also had fun tromping on the ice, playing with sticks, spotting sandhill cranes and soaking up the warmth of the day. Here are a few tips for a happy mud-filled day. 1) Carry plastic bags: If possible, make sure everyone has proper footwear before heading out. 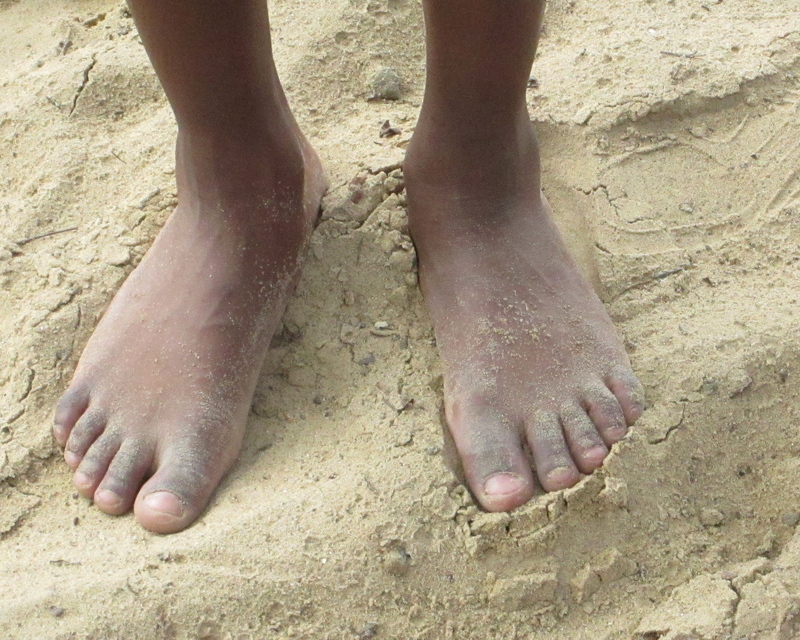 We had two girls with woefully inadequate footwear who complained the whole time – to no avail. In the future, I will always have a few plastic bags on hand. Kids can slip their feet into them before putting on their shoes. The bags will keep their feet mostly dry. 2) Ignore the whiners: No sooner had we gotten out of the van and a few kids were complaining about the mud. It didn’t take long for them to realize that mud is a lot of fun. 3) Get Dirty: Don’t worry if the kids get a little dirty. A bit of mud will not hurt them at all. We are here at Cherokee Marsh. Show don’t tell. Teach kids to be bold in the face of sloppiness and how to prepare for it. 4) Don’t forget the binoculars: In a group of 12, it’s good to have about 3-4 pair. and leaves in a cup to make a delightful mud stew. Other kids just enjoyed their snack. There is no need to plan activities all the time. Are we having fun yet? No caption needed here. think you know enough about the outdoors to lead a hike. All you need is a good attitude and the willingness to explore. The kids really don’t care if you know the names of birds or animals. What they care about is having fun and exploring. You can also go back and look up the animals and see if you can find them in a book or on the internet. If you need help, just send me an email at getkidsoutside@gmail.com. I know you can do it. How do you teach kids how to have fun in the mud? Post your ideas. 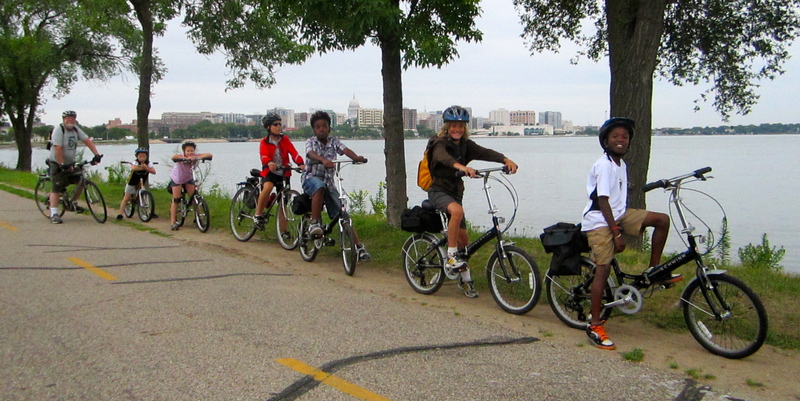 You can find Diane planning for bike club this summer and developing plans for new programs in Madison, Wisconsin. Contact her with ideas on how to get kids outside. Donate $40: Teach children to ski and they’ll learn how to deal with frustration. Learning to ski teaches valuable lessons in patience. Teach children to fish and they’ll eat for a lifetime. Teach children to cross-country ski and they’ll learn patience and how to deal with frustration. Watching kids learn to ski can be painful because they fall down so much. Watching kids learn how to get up and deal with their frustration makes up for it. Kids who love winter have a much greater chance of staying healthy and happy especially if they live in snow country. For the past 4 years, I have had the privilege of taking K-5 students from the Goodman Community Center (GCC) to Blackhawk Ski Club in Middleton to learn how to cross-country ski. In total, that’s about 50 kids. This year, the program runs from January 17 to March 7, 2013. Unfortunately, GCC’s funding is tight and the program is in jeopardy. GCC can pay for the transportation – no small contribution – but not for a teacher to get the kids to the lessons. Half the fun of skiing is drinking hot chocolate after skiing and hanging out with friends. The memories will last a lifetime. Will you donate to the Ski Club 2013 fund? Just $40 will fund a scholarship for one student to do the full 8 week class? To run the class, we need a total of $520. Of course, all donations are appreciated. To donate, click button to the right (you don’t need a Paypal account). Or, contact me via Facebook if you’d like to send a check. Thank you. Help make the winter of a few great kids. Thank you! Please let me know if you have any questions. 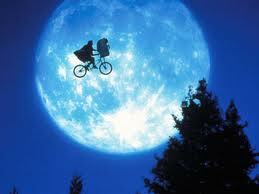 ET still inspires kids to take flight on their bikes. “I want to ride like ET,” said Jamar, during bike club last week. “You mean that you want to fly?” I asked. Thank you Jamar for reminding me of the best bike movie ever. In the movie’s most famous scene, a gang of bike-riding kids outmaneuver the cops to protect their friend ET. Kids ride like the wind through back alleys and roads and take flight from berms. All the while, Spielberg keeps the camera on the kids’ feet as they furiously pedal. Anyone who’s ever ridden a one speed bike can relate to this scene. Flight does seem possible and Spielberg captures this feeling perfectly. The dazzling moment where Elliot flies away with ET loaded in his basket captures what all kids intuitively know–that anything is possible on a bike. That’s exactly how I remember biking as a kid and it’s the primary reason why I started Bike for Life. Jamar rides like the wind toward the capital. When I was growing up, every kid in my neighborhood had a one speed bike. Just like in the movie, we rode to the park, the pool, to school and to the grocery store. We owned the road and knew all the cracks, potholes and short cuts along the way. We rode like our lives depended on it, even when it didn’t. If something happened, we’d be ready and NO ONE would catch us. At 10 years old, we ruled the neighborhood and that’s all that mattered. Bike for Life teaches kids the joy of biking as transportation. While we can’t take as many shortcuts as I took as I kid, we still go places that cars can’t go. We cruise the bike paths, careen under bridges, bump along the grass in the park, and get rock star parking at the grocery store. We teach kids that you can go anywhere and do anything on a bike. And, if you’re lucky, you might even take flight. Thanks Jamar for the reminder. The fall session of Bike for Life is now over, but you can still ride your bike well into winter. Stay tuned for more fall and winter adventures. These feet are made for biking. jumping on rocks and just plain having fun. But will they remember any of it as adults? Will Bike for Life make a difference for these kids? As Bike for Life’s summer session comes to a close, I’d like to think that the minds attached to the feet will carry with them positive memories and skills from the summer. But since I can’t attach a tracking device to each child, I can only hope that one or two memories will stick with them and keep them motivated to eat healthy and to bike later in life. Looking back at my childhood, I recall trips from elementary school and how they affected my life. A school field trip to the Milwaukee Museum in fourth grade taught me that dinosaurs were scary and cool and that there’s a great big world out there. I imagined myself on the streets of Old Milwaukee, which no doubt spurred an interest in all things historic. But more than anything, those trips gave me hope and served as an escape from a not so happy childhood (another story). I’d like to think that the same is true for the kids that attend bike club, many of which have limited means. Bike club exposes kids to new worlds and that makes them more confident and independent. When kids bike 12.5 miles, they learn that they can go anywhere. When they get exposed to new adventures, they learn to handle the unexpected. These are skills that will serve them well in life. Biking along Lake Monona with Monona Terrace and the State Capital in the background. I’d also like to think they’ll remember the teachery things, such as how to make a healthy soda drink, how to cross a busy street and how to put air in their tire. But more than likely, they’ll each take with them the one thing that touched them… perhaps biking over the bridges or under the tunnels, the elevator at Monona Terrace, or biking to the zoo. Or, they’ll remember the great snacks, or the time I fed them “bird style” because we ran out of cups (see photo below). Regardless, I am confident that they will remember something. If I’m lucky, they’ll think that bike club was cool, just like I thought that dinosaur was cool. But more than anything, I hope they remember the joy and freedom of biking. I want them to remember that for two hours each week, they were happy. If I leave them with that, I will consider my job well done. Thanks for the memories kids and see you on the bike trails this fall. Here I am feeding Soren “bird style” some of Miss Diane’s tasty homemade soda-sparkling water and a splash of apple juice – before leaving the zoo. Diane Schwartz is the founder of Bike for Life and Get Kids Outside. You can find her working on her fall biking calendar and other fall outings for the Goodman Community Center. 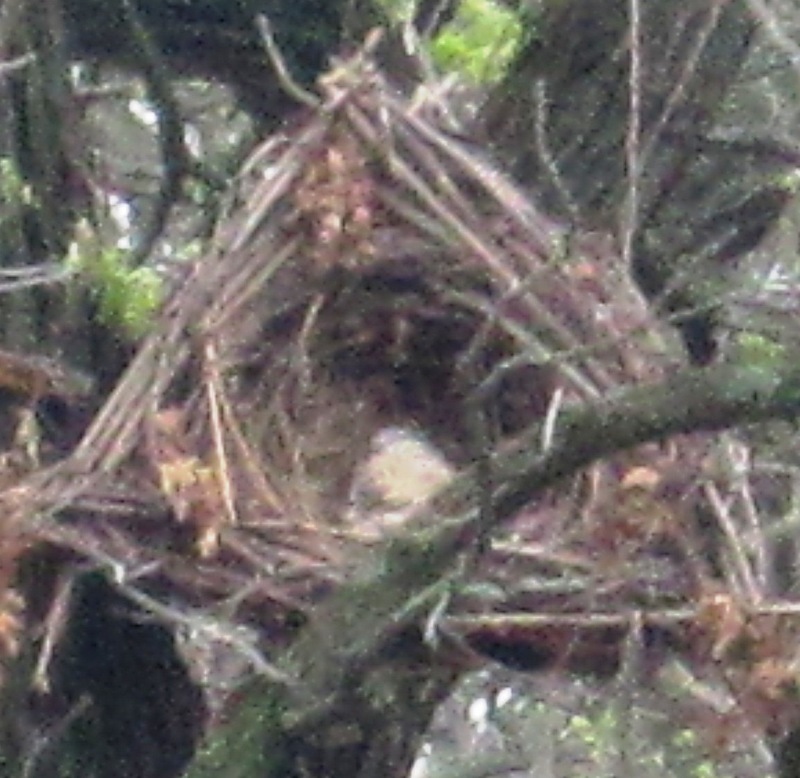 Nest with baby great horned owl taken with a small camera. Look, there’s an owl nest. Hey, check out the trout lilies. And just ahead, there’s a homeless man sleeping. So it goes at Turville Point Conservancy on a Saturday morning hike. Learning to ski is a humbling experience. Fall, get up. Fall, get up. Poles and skis slip and slide and get tangled up in the weirdest of ways. especially as they learn to maneuver hills. I can’t think of a better metaphor for life. If kids can get past the initial frustrations, they learn so much. That’s why we ask kids to make an 8-week commitment to ski club. That way, they have to work through their frustration. The end result is always a joyful celebration on the last day. In the mean time, there’s more agony of defeat than the thrill of victory, but the victory is so very sweet. Check out these photos from this week’s lesson at Black Hawk Ski Club. They really do say it all. Outdoor adventures with kids bring curious comparisons. “It looks like Africa,” said 8-year-old Marjorie as we drove into Governor Nelson State Park on a cold March day. I paused, a bit thrown by her thoughtful comment. I mean, I had never heard Wisconsin and Africa being linked geographically. And even if comparisons could be made, you’d think they’d be made during a blistering heat wave and not when the ground was still frozen. In March, the Wisconsin savanna does look like the African savanna, a sea of tan grass with a few trees dotting the landscape. I almost expected a lion to appear, the image was so vivid in my mind. 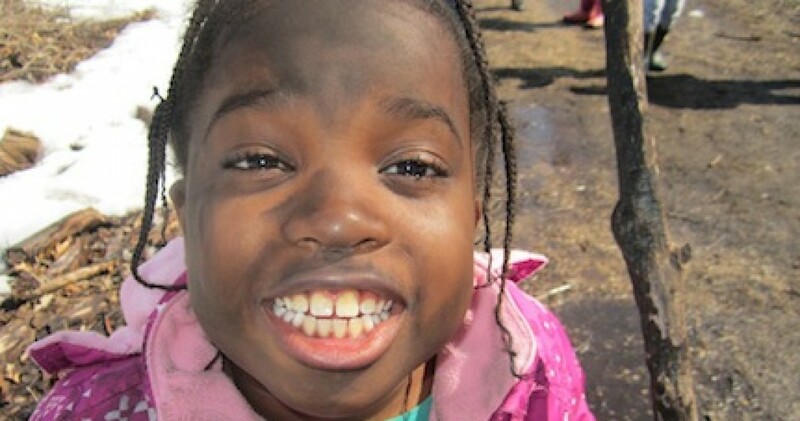 This 8-year-old girl made a deep connection between Wisconsin and Africa that can only be made by experience. This blew me away. I love being shown how to see something in an entirely new way and sometimes it takes a child to do it. 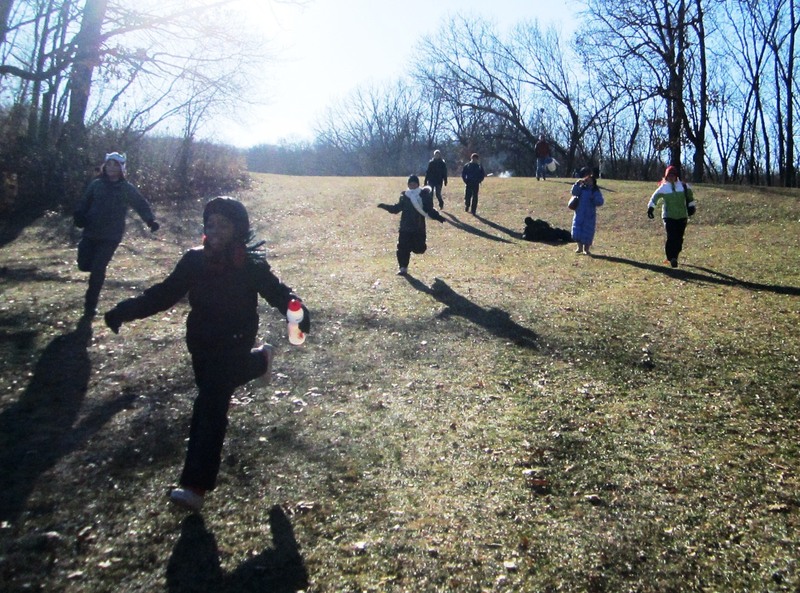 Even without snow, the kids made use of the sledding hill. Lou and his mother didn’t look too happy as we gathered at 9 a.m. on a cold, December morning for a trip to Indian Lake County Park. “I had my doubts,” mom admitted. But she showed up anyway along with 30 others. At the end of the day, they were all smiles and glad they came. – Kids ran, slid and rolled down a frost covered sledding hill. 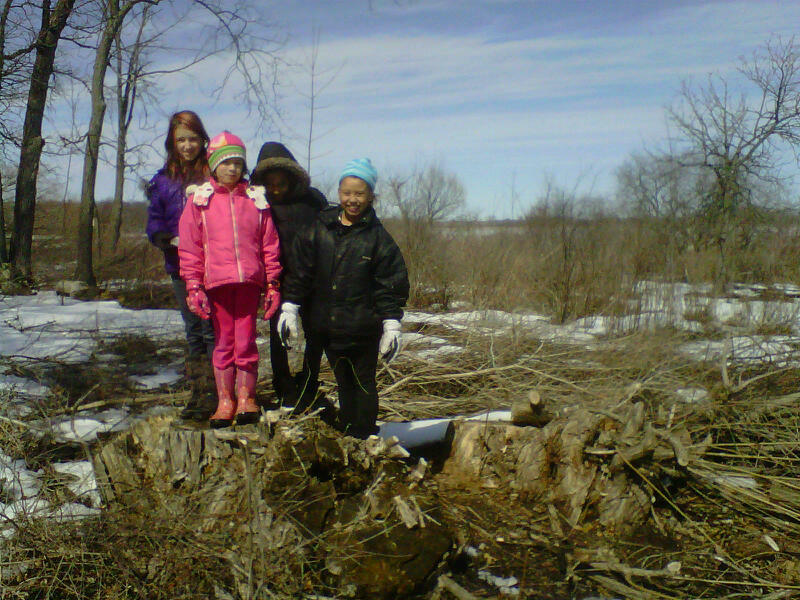 – Kids played on a huge pile of wood. 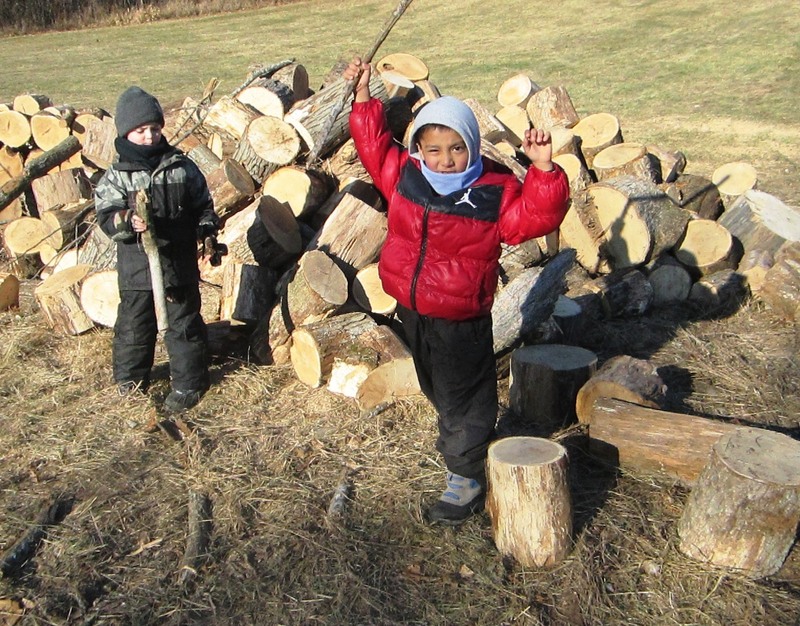 They turned the wood pile into a fort, a mountain or just a neat place to climb. They killed off space aliens, played soldier games and lots more. – Kids played with sticks, the best toys ever. – Kids examined beautiful frost crystals that coated the ground. Sticks are the best toys ever. Note the lack of mittens. – Kids helped build a fire. 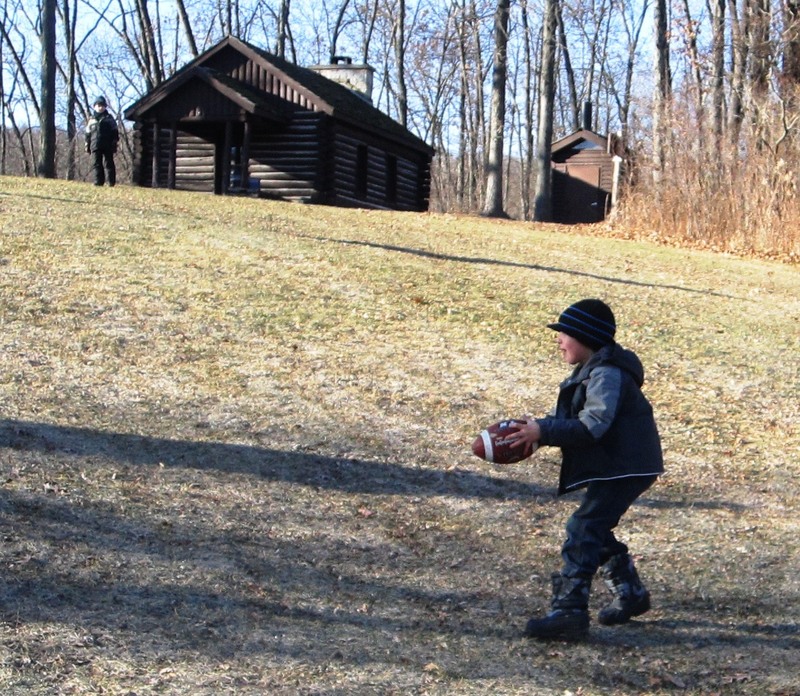 – Kids played football and kicked around a ball. – Kids hiked up the hill to see a historic chapel. – Kids ate hot dogs and hot chocolate. But mostly, the kids learned that sometimes it’s important to get up and go even if it’s cold. Parents set the example. Unfortunately, about 15 kids missed out because their parents cancelled. We forget how warm kids get when they run around. No matter how many times we asked kids to put their hats on, most didn’t listen and took them off anyway. Go figure. Kids just don’t react to cold the same way as adults. Winter is a great time to get outside. It’s important to help parents and kids learn how to enjoy the winter. How do you respond to fears about cold weather? Playing football in the morning sun. Again, no mittens. Are they crazy? Surprise: Kids like carrot juice. What do you think kids will eat? Turns out they’ll eat all three, but not necessarily in that order. I didn’t think they’d like carrot juice, but they did. They watched intently as the Willy Street Coop juice bar man turned carrots into juice with the flip of a switch. The rich, orange juice flowed out and the kids eagerly drank it up. They also loved watching peanuts turn into peanut butter in the grinder. They liked that it looked kinda gross coming out of the machine, which always helps with kids. After they tried the juice and peanut butter, I took out chips and chocolate to talk about portion size and choices in food. They squealed with delight. Sugar, salt and fat make for tough competition. No squeals for carrot juice and unsweetened/unsalted peanut butter, but then again, they had never tried them before. On the other hand, junk food, is readily available and a primary cause of obesity in kids. Can you just 12 chips? Of course, the real challenge with junk food is how much kids eat. 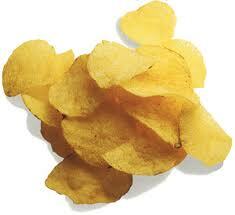 Did you know that there are about 12 chips and 250 calories in one serving? Have you ever tried eating just 12 chips in a sitting? That’s the challenge. I offered single serving bags of chips to make the point. The next time you sit down to eat chips, challenge yourself and your kids to eat just one serving. And, before you eat, read the ingredient label. Turns out that the nacho cheese flavored chips are loaded with preservatives, whereas simple potato chips contain just potatoes, oil and salt. Even in the chip world, there are choices. As for the chocolate, the package said a serving was half the bar. This seemed like a lot so we talked about that. Can you eat just a few squares of chocolate and put the rest away for another day? I know I can’t, which is why I don’t eat chips or eat sugar. I shared this with the kids so they know that there’s a choice. They don’t get it, but then again, they don’t have to, just yet. Kids are smart and while most of their food choices are made by others, I believe that this information will make a difference to them. Perhaps not now, but in the future. Bike for Life is an obesity prevention program created and run by Diane Schwartz out of the Goodman Community Center. It’s funded by the Endres Foundation and the Rosenlund Family Foundation. 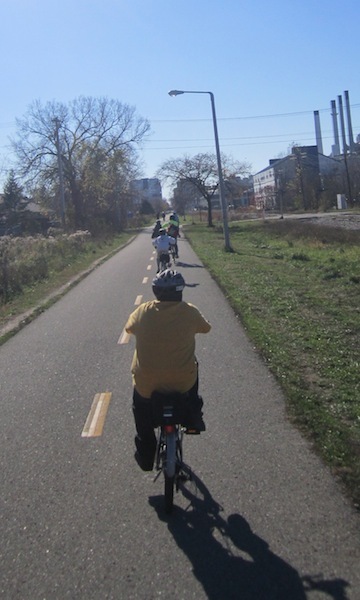 The group is enjoying the great fall weather by biking around Madison. Next week, we’ll head up to the Capitol. Ebrahim, Gavin and Juan target practice. Year ago, shooting a gun was a rite of passage for boys and BB guns were common. 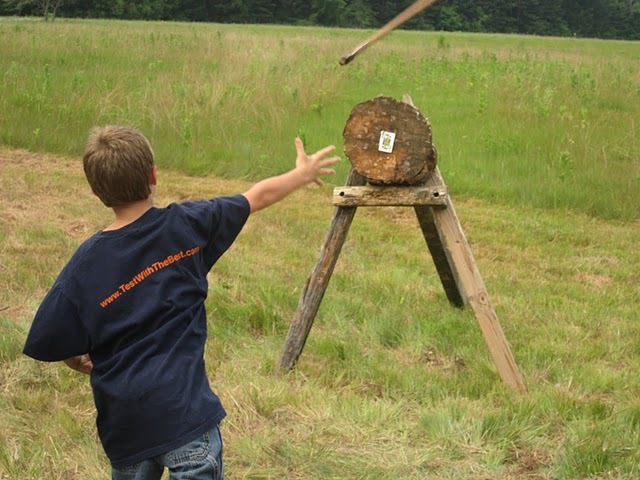 Today, BB guns and bow and arrow sets are pretty much things of the past, but not at Outdoor Skills Day at MacKenzie Environmental Education Center in Poynette. 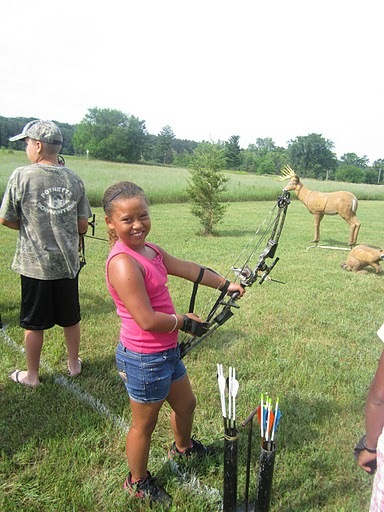 For one day each summer, kids learn how to shoot at targets, throw hatchets, cast a fishing line, cut wood, cook over a fire, start a fire without a match and lots more. I went with 13 kids ages 5 to 13 plus three parents. At first, I was a little nervous, but once I saw how great the kids were behaving, I loosened up a bit. They were so respectful of each other and of the skills they were learning. The people at MacKenzie know what they’re doing. They made it safe. 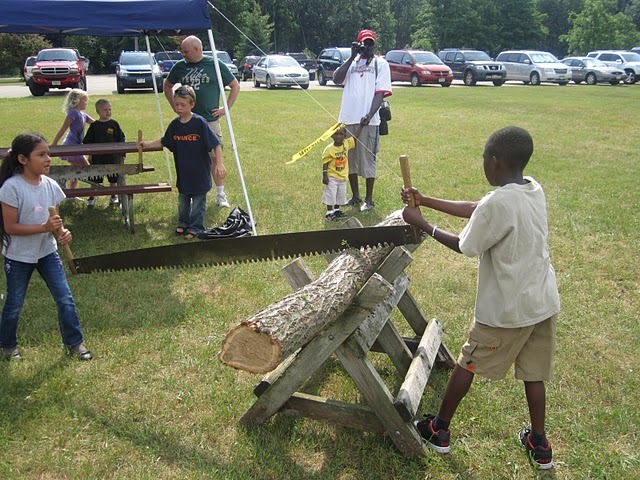 The Bowhunters Association, DNR wardens and fisheries staff, and lots of volunteers were on hand to teach kids how to do things safely. They had the all the right equipment and plenty of room. 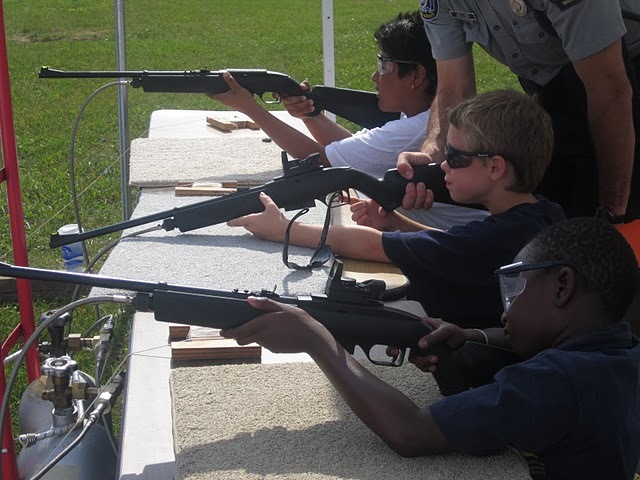 Kids learned that shooting a gun wasn’t about killing people, but about concentration and skill. It was wonderful to see the kids so focused. I could see their self-confidence grow as they practiced. 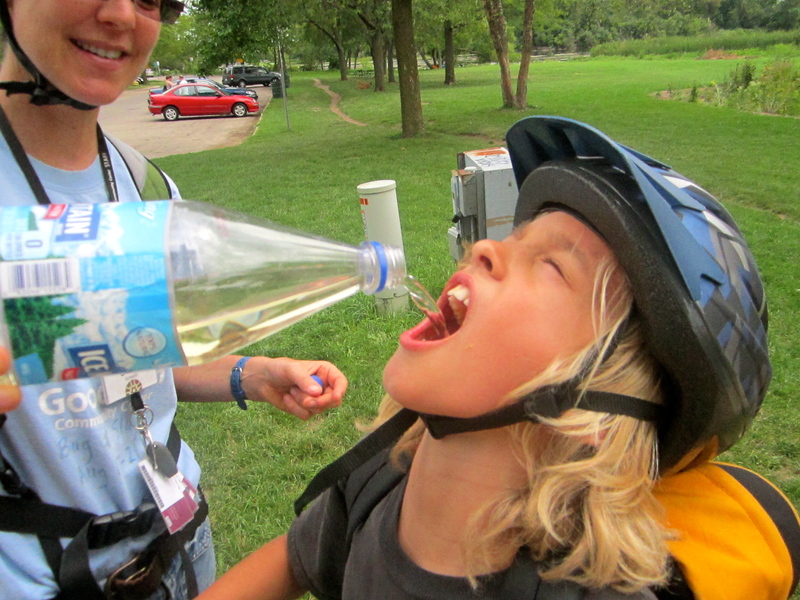 Experiential learning is so important for kids, especially high energy kids. As a result of this trip, I’m inspired to bring an archery program to Goodman Community Center or to host our own Outdoor Skills Day. We could use a few more confident, respectful kids. So what do you think? Do you think events like this are okay? What is your experience working with kids and outdoor skills? 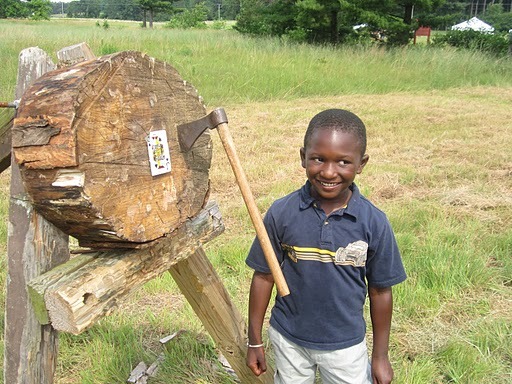 Tania (age 5) and Buba (age eight) work the cross-cut saw. 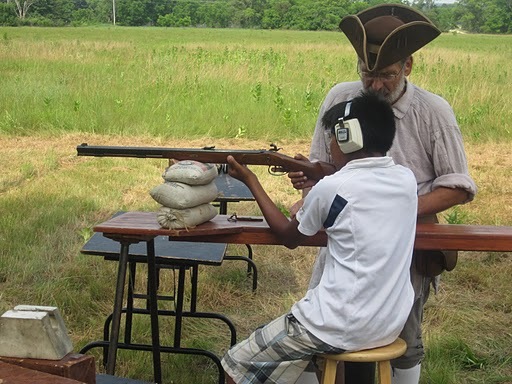 Angel (age 13) shoots a muzzle loader with help from a Wisconsin Muzzle Loader Association volunteer. Mari (age eight) gears up for archery. 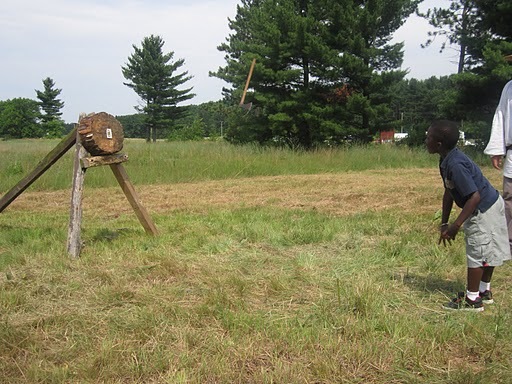 Ebrahim (age 5) throws and then hits the target. His face says it all. 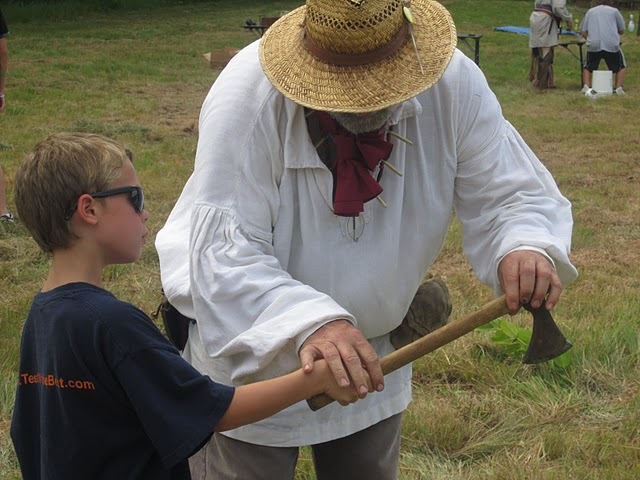 Gavin (age eight) gets instruction from a Wisconsin Muzzle Loading Association volunteer before taking aim.